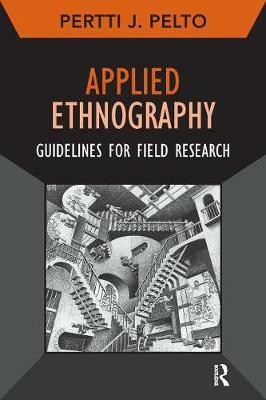 This comprehensive, engaging guide to applied research distills the expertise of the distinguished ethnographer and methodologist Pertti Pelto over his acclaimed 50-year career. Having written the first major text promoting mixed qualitative and quantitative methods in applied ethnography in the 1970s, Pelto now synthesizes decades of innovation, including examples from around the world that illustrate how specific methods yield immediate results for addressing social problems. Ideal for researchers, students, training programs, and technical assistance projects, this thorough text covers the key topics and skills required: gaining entry, recording and organizing field data, a host of specialized techniques, integrating qualitative and quantitative methods, building and training research teams, rapid assessment and focused ethnographic studies, short- and long-term ethnography, writing up results, non-Western perspectives on research, and more. "The title of this book could have been: 'Ethnography through the times;' and who better to tell the story than an experienced ethnographer, the 'Maestro' who practiced and lived it through most of his adult life?... For its depth in field experiences and rich real life examples in innovation in research methods, I wish to strongly concur with Professor Pelto in recommending this book for applied research people in the south and north.... To prospective users, all training institutions should have a few copies in their library shelves to support research skill training; ethnographic and other qualitative researchers should have one as their fieldwork companion, while for action and implementation science researchers, development agencies, a copy or two for their staffers would go a long way." "Techniques, approaches, and rationales for conducting ethnographic research have evolved greatly from the 20th-century paradigm of long-term, embedded participant observation. Today's ethnography increasingly employs a qualitative/quantitative mix and collaboration across disciplines ranging from health to environmental studies. Short-term, focused research is becoming the norm as contracted ethnographers meet deadlines for NGOs and agencies looking to make informed program changes. In-depth interviews, still an important tool, are transcribed, coded, and analyzed. Multidisciplinary teams commonly train local community members to assist with quick data collection. Pelto (emer., Univ. of Connecticut) does an outstanding job of covering a wide range of applied techniques, and providing contextualized examples from many countries. Clearly described methodologies like RAP (rapid assessment procedures), FES (focused ethnographic studies), social mapping, sampling, sketch mapping, free lists, pile sorting, and diaries are useful at all levels. Likewise, Pelto provides understandable guidelines for basic skills like gaining entry, training research teams, recording and organizing data, data coding and analysis, and writing the final report. Other authors have tended to focus on a particular specialized method (e.g., autoethnography), a particular context (e.g., education), or a particular skill (e.g., writing field notes). Unlike Han Blommaert and Dong Jie's "Ethnographic Fieldwork: A Beginner's Guide" (CH, Jan'l1, 48-2441), which only gives examples of linguistic fieldwork only, this volume is a guide to conducting applied ethnographic research in a multitude of contexts and employing one or more methodologies from the large repertoire outlined. Helpful illustrations, text boxes highlighting key concepts, and extensive references add value. Equally excellent as a course text or in the field for tackling a thorny research challenge. Summing Up: Essential. Lower-division undergraduates and above." "This book will make a significant addition to any qualitative researcher's library." The title of this book could have been: 'Ethnography through the times;' and who better to tell the story than an experienced ethnographer, the 'Maestro' who practiced and lived it through most of his adult life?... For its depth in field experiences and rich real life examples in innovation in research methods, I wish to strongly concur with Professor Pelto in recommending this book for applied research people in the south and north.... To prospective users, all training institutions should have a few copies in their library shelves to support research skill training; ethnographic and other qualitative researchers should have one as their fieldwork companion, while for action and implementation science researchers, development agencies, a copy or two for their staffers would go a long way. Techniques, approaches, and rationales for conducting ethnographic research have evolved greatly from the 20th-century paradigm of long-term, embedded participant observation. Today's ethnography increasingly employs a qualitative/quantitative mix and collaboration across disciplines ranging from health to environmental studies. Short-term, focused research is becoming the norm as contracted ethnographers meet deadlines for NGOs and agencies looking to make informed program changes. In-depth interviews, still an important tool, are transcribed, coded, and analyzed. Multidisciplinary teams commonly train local community members to assist with quick data collection. Pelto (emer., Univ. of Connecticut) does an outstanding job of covering a wide range of applied techniques, and providing contextualized examples from many countries. Clearly described methodologies like RAP (rapid assessment procedures), FES (focused ethnographic studies), social mapping, sampling, sketch mapping, free lists, pile sorting, and diaries are useful at all levels. Likewise, Pelto provides understandable guidelines for basic skills like gaining entry, training research teams, recording and organizing data, data coding and analysis, and writing the final report. Other authors have tended to focus on a particular specialized method (e.g., autoethnography), a particular context (e.g., education), or a particular skill (e.g., writing field notes). Unlike Han Blommaert and Dong Jie's "Ethnographic Fieldwork: A Beginner's Guide" (CH, Jan'l1, 48-2441), which only gives examples of linguistic fieldwork only, this volume is a guide to conducting applied ethnographic research in a multitude of contexts and employing one or more methodologies from the large repertoire outlined. Helpful illustrations, text boxes highlighting key concepts, and extensive references add value. Equally excellent as a course text or in the field for tackling a thorny research challenge. Summing Up: Essential. Lower-division undergraduates and above. This book will make a significant addition to any qualitative researcher s library. Paul G. Ward, Anthropology and Aging"
"Pelto has produced an important and unique text which fills a niche: it teaches research methods to non-researchers in a manner that is accessible but not insulting. [T]he text would also work very effectively in a first course on ethnographic methods at the undergraduate level. Indeed, I will most likely use it in this manner because, not only is it a highly competent methods text, it anchors ethnography in the real world issues of poverty and suffering and shows how research can contribute to solutions. In a word, Pelto shows us how and why ethnographic enquiry continues to be relevant to everyone." James B. Waldram, British Journal of Psychology"